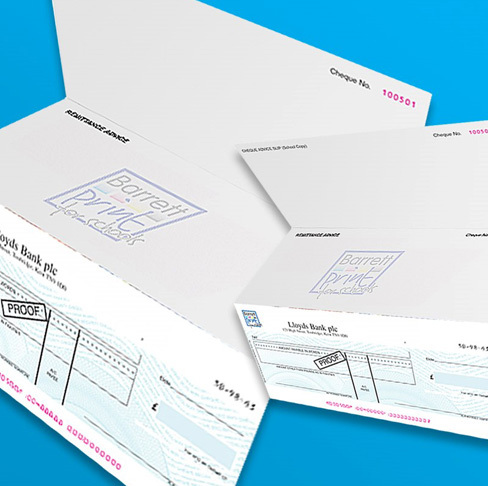 Most schools are now operating an accounting system using specially printed cheques, which are infilled automatically. Not only does this save time in writing cheques, it eliminates any chance of incorrect addition or writing the incorrect amounts on the cheques. The time saved in using specially printed cheques is incalculable and the final result is much more professional and concise. All cheques are produced within the guidelines set by APACS. They are produced on 96grm CBS1 paper, using UV/solvent sensitive inks. All cheques are approved by the bank without any need for you to get involved. The ordering of school cheques has never been simpler. We have devised an order form which takes all the headaches away, a design team which will put together an attractive proof and a reminder system which means you will never run out, always benefitting from the low per 1000 price which we offer across the board to all schools. All our prices include your school logo (in black) , bank approval, standard APACS features & delivery. There are no hidden extras. Should you wish to have your logo in colour, the prices do increase, but this can be priced up on request. Simply call 01474 56438 or email sales@barrettprintforschools.co.uk who will be only too pleased to piece together a bespoke costing for you.